Explain the precautions that must be taken when handling, storing, and disposing of resins, reinforcements, and other materials used in composites. Include in your discussion the importance of health, safety, and environmental responsibility and awareness. Describe what a material safety data sheet (MSDS) is and tell why it is used. Explain what are composite materials. Include a brief history of composites and how they have developed. Compare the similarities and differences between composites and wood, aluminum, copper, and steel. Explain the physical, electrical, mechanical, corrosive, flammability, cost, and other such properties. For each of these raw materials, give one example for how it can be shaped and used for a specific application. Discuss three different composite reinforcement materials, their positive and negative characteristics, and their uses. Obtain the MSDS for each one and discuss the toxicity, disposal, and safe-handling sections for these materials. Discuss three different resins used in composites, their positive and negative characteristics, and their uses. Obtain the MSDS for each one and discuss the toxicity, disposal, and safe-handling sections for these materials. Include thermoset resins and thermoplastic resins in your discussion. For each of the three resins you chose for requirement 3b, think of a new application that might be worth developing. Visit a company that manufactures or repairs products made with composites. Discuss what you learn with your counselor. Find three composites-related websites. Share and discuss what you learn with your counselor. 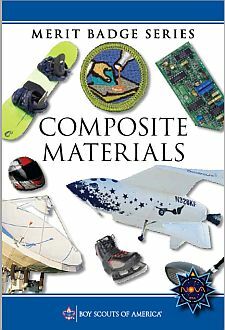 Use composite materials to complete two projects, at least one of which must come from the Composite Materials merit badge pamphlet. The second project may come from the pamphlet OR may be one you select on your own that has been approved by your counselor in advance. With your counselor's assistance, find an appropriate site where the projects can be safely completed under your counselor's supervision and/or the supervision of an adult approved by your counselor who is knowledgeable about composites. With your counselor, determine how the finished projects will be evaluated. Using those guidelines, evaluate the completed projects with your counselor.